Climate change is expected to alter stream temperature and flow regimes over the coming decades, and in turn influence distributions of aquatic species in those freshwater ecosystems. To better anticipate these changes, there is a need to compile both short- and long-term stream temperature data for managers to gain an understanding of baseline conditions, historic trends, and future projections. Unfortunately, many agencies lack sufficient resources to compile, QA/QC, and make accessible stream temperature data collected through routine monitoring. Yet, pooled data from many sources, even if temporally and spatially inconsistent, can have great value both in the realm of stream temperature and aquatic response. The NorEaST web portal was developed to serve as a coordinated, multi-agency regional framework to map and store continuous stream temperature locations and data for New England, Mid Atlantic, and Great Lakes States. 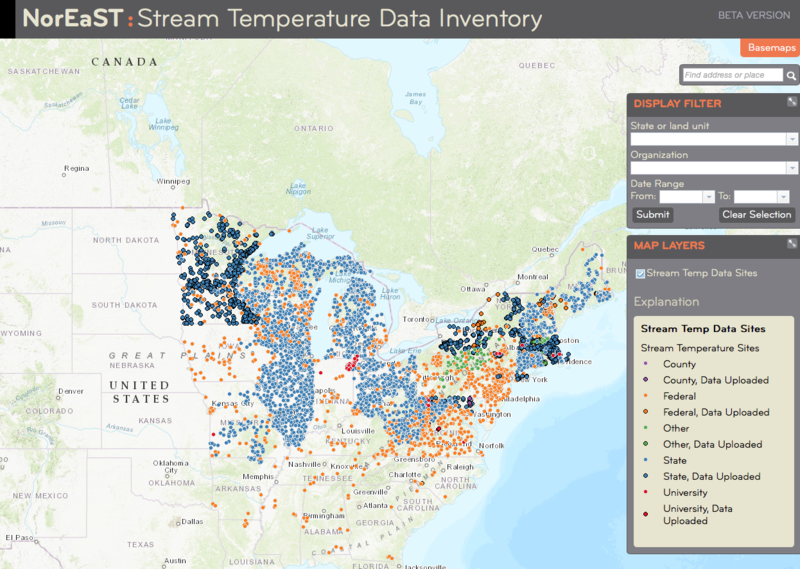 NorEaST consists of a mapper where the public can view locations and metadata for current and historic stream temperature monitoring sites, a database where data stewards can store and manage their data, and web services to connect, communicate, and serve data for use in analysis and applications. Currently, stream temperature monitoring locations and metadata can be viewed for more than 10,000 monitoring locations across 30 states, contributed by 40 different organizations. Organizations collecting continuous stream temperature data can request to become NorEaST users, data stewards can use the web portal to store and manage their organization’s continuous stream temperature data. 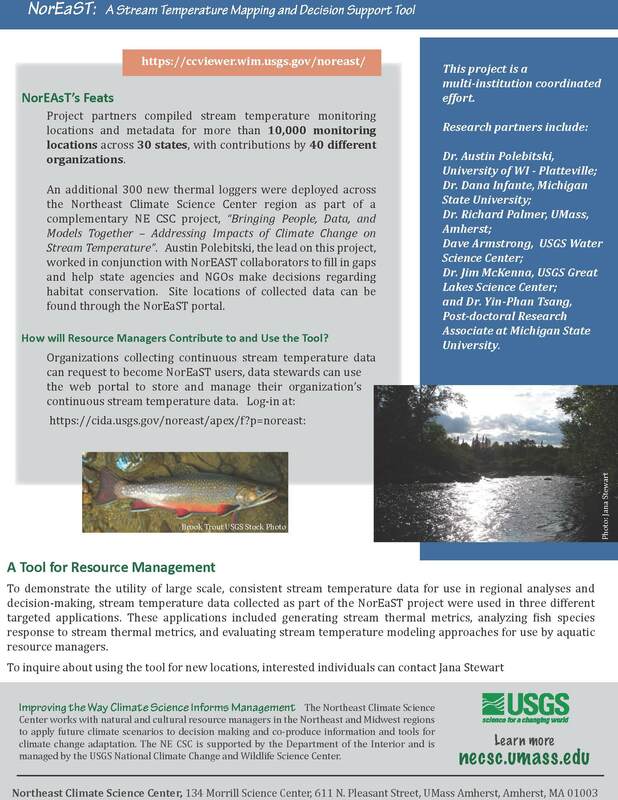 To demonstrate the utility of large scale, consistent stream temperature data for use in regional analyses and decision-making, stream temperature data collected as part of the NorEaST project were used in three different targeted applications. These applications included generating stream thermal metrics, analyzing fish species response to stream thermal metrics, and evaluating stream temperature modeling approaches for use by aquatic resource managers. A website developed to serve as a coordinated, multi-agency regional framework to map and store continuous stream temperature locations and data for New England, Mid Atlantic, and Great Lakes States. Stewart, Jana S. "NorEaST: A Stream Temperature Inventory Network and Decision Support Metadata Mapper", 2015. Jana Stewart, NorEaST Web Portal: Highlights from a multi-agency approach to manage and share continuous stream temperature data. American Fisheries Society Annual Meeting, Portland, OR. August 18th, 2015. Dana Infante, MSU, NorEaST Web Portal, National Stream Internet Workshop, organized by USFS and Trout Unlimited, Boise, ID. April 23, 2015. Jana Stewart, Stream Temperature Modeling and Data: From Wisconsin to NorEaST. Brook Trout – Stream Temperature Modeling Workshop, April 7th – 8th, USFWS Regional Office, Hadley, MA. April 7, 2015. Jana Stewart, NorEaST - A Stream Temperature Web Portal to map and manage locations and data in the USGS Northeast Climate Science Center Region. North Atlantic Landscape Conservation Cooperative (NALCC) Science and Data Committee. March 10, 2015. Jana Stewart, NorEaST - A Stream Temperature Web Portal to map and manage locations and data in the USGS Northeast Climate Science Center Region. National Fish Habitat Partnership (NFHP) Science and Data Committee. January 23, 2015. Presentations and Demonstrations at NorEaST User Testing Workshop sponsored by our NorEaST Project Team, USGS WI Water Science Center, Middleton, WI. December 9th – 10th, 2014. 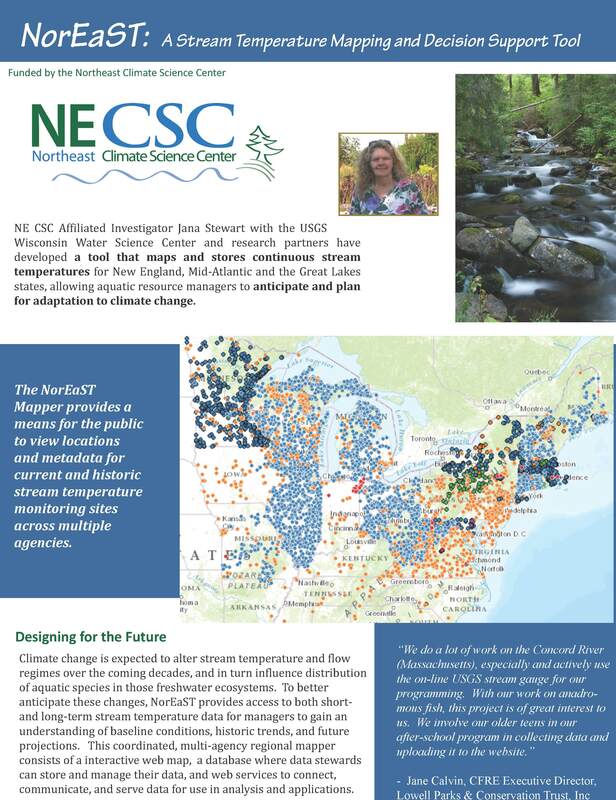 Jana Stewart, NorEaST - A Stream Temperature Web Portal to map and manage locations and data in the USGS Northeast Climate Science Center Region. Lake Superior Lakewide Area Management Plan (LAMP) Working Group. December 3, 2014. Jana Stewart. NorEaST Web Portal Stream Temperature Data Uploading. Yin-Phan Tsang (MSU), Calculating temperature summary statistics. Jana Stewart, NorEaST: A stream temperature web portal for evaluating climate-change effects on streams of the USGS Northeast Climate Science Center region, National Workshop on Large Landscape Conservation, Washington DC. October 24, 2014. Jana Stewart, Data Infrastructure for Monitoring Networks meeting. Webinar to USEPA and USGS for meeting organized by Britta Bierwagen, US EPA Research to discuss coordination of sensor networks with USGS and EPA, June 18th, 2014. Jim McKenna, Webinar with NY DEC, to provide overview of NorEaST, Tools to Evaluate the Effects of Climate Change. January 2014. News: Web Portal Update. May 7, 2014.